Produce Type I and Type III reagent grade water directly from potable tap water. For applications requiring very low organic contaminant levels, the Direct-Q 3 UV system also incorporates a dual wavelength UV lamp to produce water with <5 ppb TOC, making it suitable for HPLC, GC, ILC and TOC analyses. - Type I water for HPLC mobile phase preparation, sample dilution, buffer and cell culture media preparation, preparation of chemical solutions used with titrators, spectrophotometers and electrophoresis systems, preparation of culture media and reagents for molecular biology applications. - Type III water for low-volume non critical applications such as glassware washing or rinsing. - Produce Type I ultrapure water (18.2 MOhms·cm resistivity at 25 °C and < 10 ppb Total Organic Carbon) on demand directly from potable tap water. - Available with a built-in 185 and 254 nm UV lamp for production of low TOC water required by organic-sensitive applications. - Produce Type III (Reverse Osmosis) water for basic lab applications at a flow rate of 2.4 L/hr at 15 °C. Type III water is easily available from the 6 L built-in reservoir. - Maintenance reduced to a simple cartridge change once or twice a year. - Ideal for laboratories that do not have easy access to pretreated water and need between 1 and 10 L of ultrapure water per day. - Alarm warning in case of a sudden drop in the quality of the product water. - Dispensing adapted to different size laboratory glassware. - Time-saving fixed volume dispense. 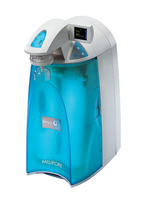 Type I ultrapure water for laboratories wich require less than 5 liters per day. The Simplicity portable water purification system can be located anywhere in your laboratory. It requires no special installation, no water feed connection and produces ultrapure water on demand from pretreated water (Elix® system, distilled, deionized or reverse osmosis water). Simplicity ultrapure water, produced and used at the point-of-use, is not subject to the degradation and contamination that affects bottled water. The intuitive color graphic display of the Simplicity system means that you can instantly see all system parameters, whether you want to know the water quality, reservoir level or when to replace the pack. With its integrated, removable reservoir, the Simplicity system is designed to make your work easier. The Simplicity UV system contains a built-in dual-wavelength UV lamp (185 and 254 nm) to reduce organic contaminants to < 5 ppb in your ultrapure water, making it suitable for your sensitive applications, such as HPLC, GC and TOC analysis. Maintenance reduced to a single cartridge change once or twice a year, based on the resistivity value displayed.